Are you still designing web sites like it's 1999? If so, you're in for a surprise. 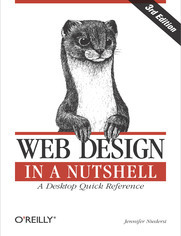 Since the last edition of this book appeared five years ago, there has been a major climate change with regard to web standards. Designers are no longer using (X)HTML as a design tool, but as a means of defining the meaning and structure of content. Cascading Style Sheets are no longer just something interesting to tinker with, but rather a reliable method for handling all matters of presentation, from fonts and colors to the layout of the entire page. In fact, following the standards is now a mandate of professional web design. 3.3. Designing "Above the Fold"
5.3. Who Is Responsible for Accessibility? 8.4. Which Standard Is Right for You? 24.5.5. Which Should You Use? 29.6.1. Should You Worry About the Web Palette?